Lucky stones in unusual places always feel even luckier than usual. Maybe it is the surprise--again--of finding one. Johnnie and Mikel tucked one into a garden wall. 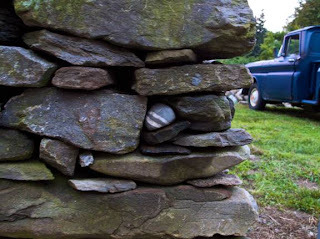 I have always loved the look and feel of a stone wall. Not those architectural wonders that are exhibited at the home and garden shows, but the ones that ramble through New England fields and are buried in hedgerows in Ireland and Scotland. My favorites may look slightly unstable but I know they have been holding their surroundings safe for eons. I like exploring them, finding the occasional small plant tumbling out of them or the odd treasure tucked in by a child or a whimsical grown-up. Your lucky stone brought back a wonderful memory. thanks.